The Carling Cup may be regarded as low on the list of priorities for some clubs - but there will be plenty of excitement and anticipation when Tottenham meet Burnley and Derby face Manchester United in this week's semi-finals. When I was at Liverpool, the big prizes were the European Cup, the League Championship and the FA Cup but that did not mean we did not take the League Cup seriously or did not want to win it. The semi-final of any major competition is massive. There is the prize of a Wembley final, with the nation watching, the prospect of silverware and a place in Europe. And the players of Manchester United and Spurs will be thinking about that just as much as Burnley and Derby. Sure, the Champions League is the big one these days - along with the Premier League- but I know that I never played in a League Cup semi-final or final thinking it was a lesser game. I never walked out at Wembley in front of 90,000 people with Liverpool to play in one of these finals thinking it would not matter as much if we lost. Professional footballers want the experience of major finals, Wembley appearances and winning trophies and that stands for the Carling Cup as well as other tournaments. Spurs got great joy from winning the trophy last year, especially when they thrashed rivals Arsenal in the semi-final before beating Chelsea at Wembley. They are still struggling at the lower end of the league and the prospect of a Wembley appearance will give players, the manager and supporters a huge lift. The thought of Wembley will be a big incentive for all four teams still left in the Carling Cup. And while there is always talk of the so-called big clubs fielding weakened sides, Spurs boss Harry Redknapp and United manager Sir Alex Ferguson will be putting out teams they feel will beat Burnley and Derby County to reach the final. For them, defeat is not an option in any match they play. Manchester United's "weakened" team is still strong in anyone's eyes and I always hold up John O'Shea as an example of this. He might be part of a line-up that is not full of Ferguson's first choices but every time I see him he does a great job in about six different positions. It is always seamless and always demonstrates that he is a player who would be totally at home at any of the top clubs in this country. I have to say I do not think Derby will beat Manchester United over two legs because even if Ferguson leaves out some of his big names, he still has such strength in depth to play with. The message for Derby is to go out, have a go and see where it takes you - and if it does not work, take the money and run. Burnley will fancy their chances against Spurs, although how highly you would rate their chances depends on what Spurs team turns up. If you get the Tottenham team that is full of confident, quality players who are high on the sort of confidence Redknapp can give them, then you would say they would reach their second successive final. 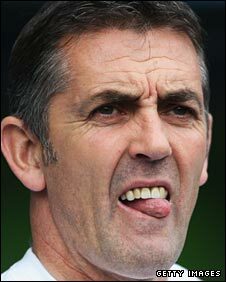 But Burnley are having a great season and their manager Owen Coyle has done a fantastic job to have them in contention in both the Championship and the Carling Cup. Burnley need to play at a high tempo and get into Tottenham's faces because then they could have one of their bad days. And the Clarets will not lack in confidence, having put away Chelsea and Arsenal in previous rounds. There are teams in the Premier League who can be faced with that type of challenge, not play well and yet still grind out a result. Manchester United, Chelsea and now Liverpool fall into that category. Spurs could just be unsettled but if I was a betting man I would still go with them meeting Manchester United in the final. The FA Cup fourth round draw threw up a tie that will have everyone on Merseyside buzzing, with Liverpool and Everton meeting at Anfield. It is massive, offering up the prospect of two derby games inside a week - two encounters that could conceivably shape Liverpool's season. Liverpool fans have got the feeling that they are really back in the big time, with big games coming thick and fast, especially at Anfield. But what a chance for Everton to put a marker down. They have been formidable away from home this season and once again manager David Moyes has done a fantastic job on limited resources. It is an enticing prospect for both clubs. Your offer for BritishSportsNews.com should reflect market value. Offers below $1000 US are ignored.